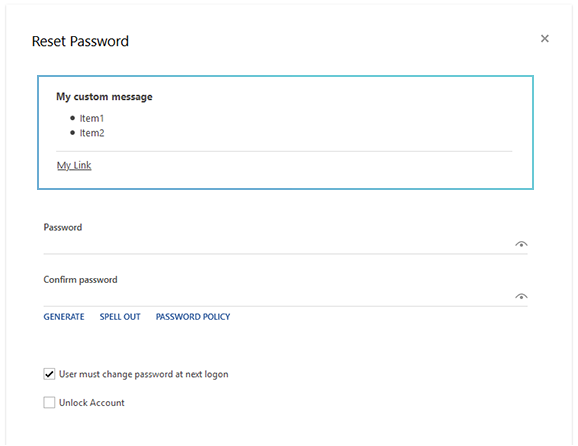 In this tutorial, you will learn how to configure password reset in Adaxes Web Interface. You can, for example, specify how to generate the initial password, which Account Options will be selected by default, whether it will be possible to unlock user accounts, etc. 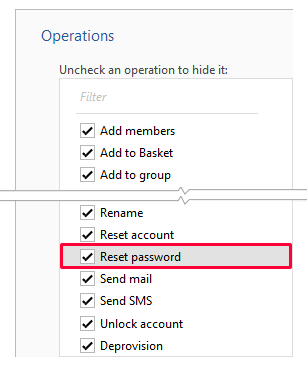 In the Operations section, select Reset password. Activate the Configuration tab and customize the operation. Specify a password to be used as default. If you want the password to be based on properties of the user whose password is reset, use value references (e.g. %department%, %employeeID%). Value references will be replaced with the corresponding property values of the user account. Alternatively, you can generate a random password. For example, %adm-RandomString,12% can be used to set the default password to a random string of the length of 12 characters. Select the Read-only option to disable the password field. In this case, it will not be possible to change the default password. Allows generating a random password that meets complexity requirements of the password policy assigned to the user. Allows viewing the new password spelled out using the phonetic alphabet. Allows viewing the password policy assigned to the user. Select Unlock Account to allow unlocking accounts when resetting passwords. Select Send SMS verification code to allow verifying a user's identity with the help of an SMS code. You need to configure SMS settings for Adaxes service to be able to send SMS messages. 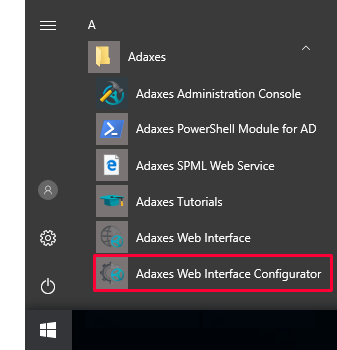 To configure SMS settings, right-click your Adaxes service in Adaxes Administration Console, click Properties in the context menu, and activate the SMS Settings tab. 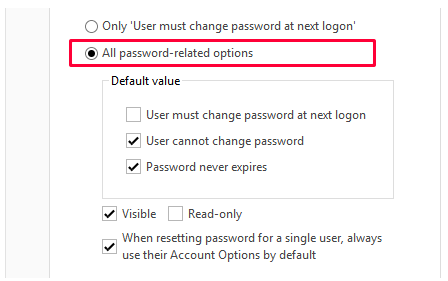 The Modify Account Options checkbox determines whether it is possible to customize password-related Account Options when resetting passwords. 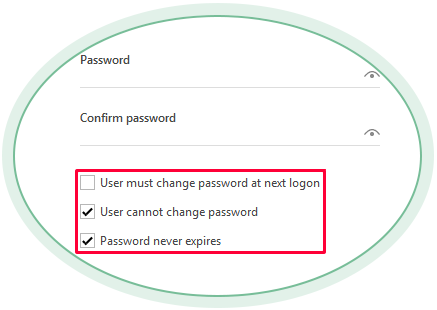 To allow changing only the User must change password at next logon option, select Only 'User must change password at next logon'. In the Default value section, specify whether the option will be selected by default. To prevent users from changing the default value, clear the Visible checkbox to hide the option, or select Read-only to disable it. To allow changing all password-related Account Options, select All password-related options. In the Default value section, specify which Account Options will be selected by default. The specified settings will be ignored if the When resetting password for a single user, always use their Account Options by default option is selected and the password is reset for a single user. In this case, the user's Account Options will be used as default Account Options. To prevent users from changing the default values, clear the Visible checkbox to hide the options, or select Read-only to disable them. Optionally, you can place a custom message on the Reset Password dialog. Activate the Custom Message tab. Check the Display custom message checkbox. Specify the message text in the edit box below. 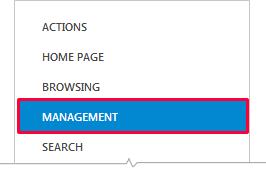 The settings in a section can be applied to other Web Interface types. 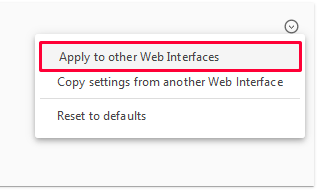 For this purpose, in the top right corner of the section, click the down arrow button and choose Apply to other Web Interfaces. 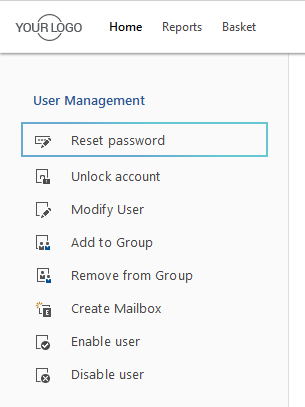 In Adaxes Web Interface, the Reset Password operation can also be available from the Actions pane. 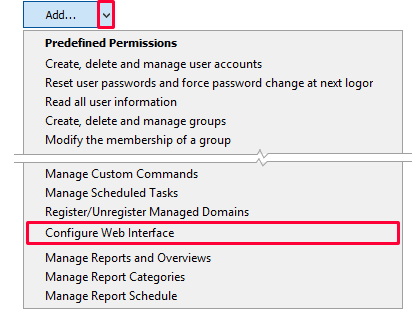 The settings described in this tutorial are applied by default to all Reset Password operations in the Web Interface. However, you can configure each operation available in the Actions pane separately. 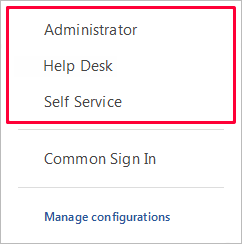 For more details, see Configure Actions Pane.